I'm not artistic. I'm Craftastic. My dad makes wood albums. The unfinished ones are really cool and customizable. The cedar ones are beautiful for display (they come with a stand). Click on the books to see his stuff. I'm also a geek who likes to figure out how to make interesting things. I wear many hats and consider myself a renaissance woman but, above all, I love to create! 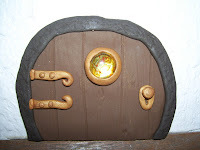 This weekend I experimented with polymer clay with the idea of making a fairy door. This one is only just a few inches across. I used an amber faux gem in place of the little window on it. I thought it would be fun to have a variety of fairy doors throughout the house, each made to look different from the others. I like the woodsy effect on this one but I think it needs aging with some paint and perhaps a little moss to complete the look. This is so magical looking - I love it! This is an amazing website, I've enjoyed everything on here ... was holding back on the gems, the fairy foors, well, I'm gonna have to make these. Wonder how long it'll take for my roommate to notice.